Bomber vintage anni 80 Los Angeles Raiders . La giacca si trova in buone condizioni, presenta però dei segni dovuti agli anni e all'utilizzo, quali bottoni graffiati e patch posteriore consumata. Esattamente come in foto. SIZE: LARGE. COLOR: BLACK / WHITE / GREY. BEFORE BUYING. Satisfactory, yellowing found on white panels and inside of collar. Marks found on inside of hood, and on front and back embroidery. Marks also found on sleeves and back. Size: Small. Length-Under Collar to Bottom: 27”. 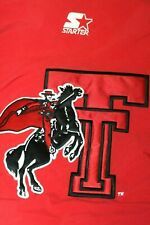 Texas Tech Red Raiders. Zip and button front. Size is XL. Oakland Raiders Vintage NFL Embroidered varsity Button Down Big logo Jacket XL. Condition is Used. Shipped with USPS Priority Mail. Vintage Oakland Raiders Starter Parka Puffer Jacket Mens Half Zip Los Angeles L. Condition is Pre-owned.